The return of our friend Akira Mizutani and his band Tokyo Chutei Iki, for a free concert as part of the London Jazz Festival. Adventurous Japanese baritone saxophone ensemble Tokyo Chutei Iki cross genres from jazz to classical to rock and beyond. Today’s show allows the audience to see them in an open rehearsal. 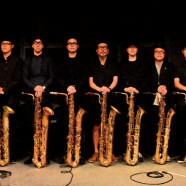 Tokyo Chutei Iki – probably the greatest Japanese 10 baritone saxophone ensemble in the world! Their only instruments are their voices and their baritone saxophones. Their music is adventurous and cross genres from jazz to classical to rock and beyond. Their latest album “Great Baritonnia” was released at the end of 2017. The cover art features Big Ben. London, a city they love very much, has been chosen as the place to give tunes from the new album their overseas debut. Tokyo Chutei Iki’s live performances are dynamic, surprising and joyful. Truly unique. Tokyo Chutei Iki are very happy to be returning to EFG London Jazz Festival for the first time in 4 years. Please do not miss them!